Newly hired head coach Jeff Tyson will be looking to end a four-year drought in qualifying for the ODAC Tournament. The women's volleyball team will open the 2012 season at St. Vincent College's invite, the Bearcat Challenge, in Latrobe, Pa., playing four matches over Aug. 31 and Sept. 1. Eastern Mennonite released its 2012 women’s volleyball schedule today, and the Lady Royals will get the benefit of playing their top opponents in Harrisonburg this year. The women have 11 home matches on their 24-match slate, including hosting tradition ODAC powers Washington and Lee and Randolph-Macon. EMU welcomes in the Generals for the home opener on Sept. 11, and takes on the Yellow Jackets one week later on Sept. 18. The two teams finished first and second, respectively, in the ODAC standings last fall, with R-MC winning the postseason tournament. The Lady Royals also get their biggest rival in Yoder Arena this year, with Bridgewater College coming in on Sept. 29. That contest will be the first match of a tri-match with non-conference opponent North Carolina Wesleyan, and is the second of two tri-matches. Emory & Henry and Southern Virginia visit on Sept. 15 in the other. 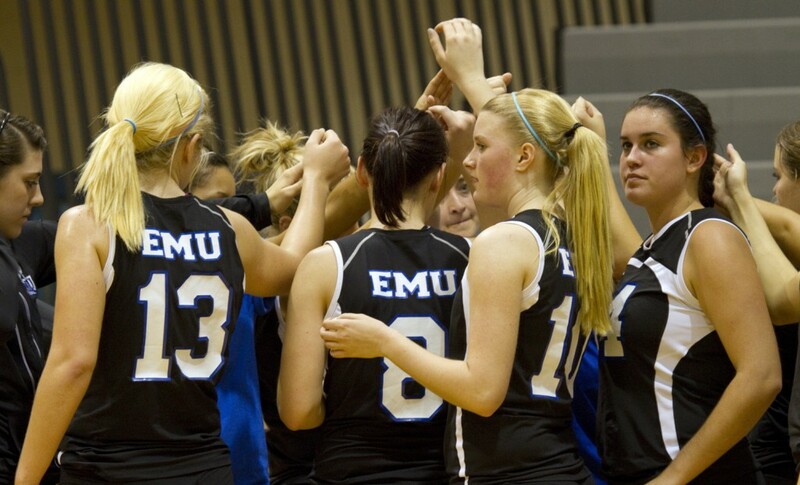 As part of EMU’s Homecoming Weekend on Oct. 13, the women take on Lancaster Bible. Other home contests include: Guilford, Ferrum, Roanoke and Mary Washington. The date with the Eagles closes the regular season on Oct. 27. Eastern Mennonite opens the season at St. Vincent College’s invite, the Bearcat Challenge, in Latrobe, PA. The young women will play four matches over Aug. 31 and Sept. 1. Last fall EMU finished 7-20 with just one senior on the team. Newly hired head coach Jeff Tyson will be looking to end a four-year drought in qualifying for the ODAC Tournament.